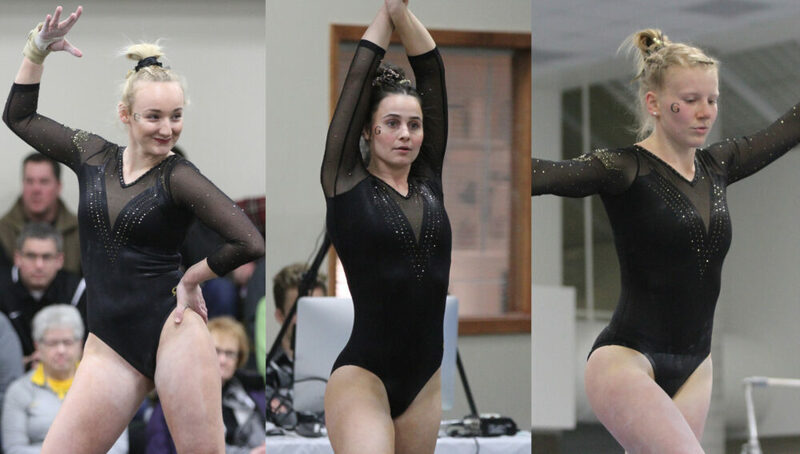 OSHKOSH, Wis. – Three Gustavus gymnasts Saturday competed at the NCGA Championship at UW-Oshkosh and brought home three All-America honors. Both Brooke Merila (Fy., St. Michael, Minn.) and Amanda Malo (Sr., Greenwood, Minn.) earned All-America in the all-around, while Malo added an All-American performance on the bars. Merila totaled a 37.350 in the all-around to place fourth and Malo accumulated a 36.900 to take seventh. Malo’s 9.575 on the bars was good for sixth place. Sam Ardy (Sr., Thousand Oak, Calif.) finished the all-around with a 35.075 to place 10th. Gustavus now has 103 total All-America distinctions in its program history. Malo finishes her career as a three-time All-American. Awesome. Great job one and all. Amanda and Sam maybe not your best performance day it appears, that h but finishing as All Americans is a fitting culmination to your wonderful careers You have both made us proud to call you Gusties. Lots of great things ahead for both of you I am convinced. All I can say to Brooke is you are one scary young woman, top four in your first year at the big show. Three years left to hone the skills. Get ready for the big time. Love you guys, that goes for the whole gang!